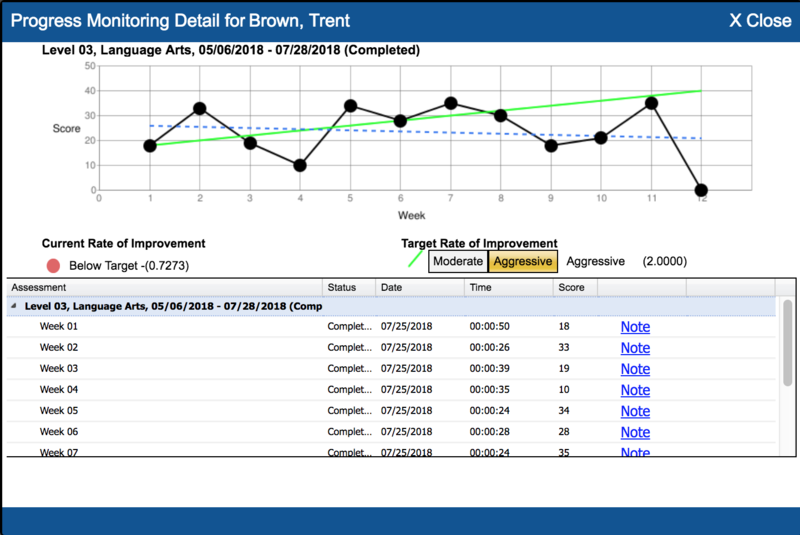 Target ROI, or Rate of Improvement, is the estimate of how much the student is expected to improve over the duration of the intervention period. On the student's graph, the Target Rate of Improvement is shown as a solid green line. You will decide whether a moderate or aggressive goal is appropriate for your student. Classworks automatically determines the Target Rate of Improvement based on the goal selected. The goal provides a target for Target Rate of Improvement to compare against the student's Current Rate of Improvement. You know your student better than anyone else and should use your best judgment for setting your students' goals, but there are a few things to think about. Consider the frequency of the interventions the student is receiving and the acceleration of learning expected during the intervention duration. Set a realistic yet challenging goal. You want the students to see success and be challenged without becoming frustrated. The goal can be changed after the set of probes is assigned. It can be adjusted by individual student if needed. If you are unsure of which goal to select, start with the lower goal (moderate). You can always raise the goal based on the student's actual ROI if needed. Note: If the student scores above the end target on the first CBM, the first two CBMs, or the first 3 CBMs, a target ROI will not be calculated.